Israel immediately protested and the headlines were changed to,“Israeli police kill 3 alleged Palestinian attackers.” When Israel protested again, it said, “Palestinians kill Israeli officer, wound another before being killed.” This has been going on for quite a while, and nothing can be done. Answer: Nothing will help, either. On the one hand, this angers me, but on the other hand, I understand where it stems from. There are conflicts all over the world, and the reason is the terrible relations between people. At the same time, the reason for the conflict itself is that Israel isn’t fulfilling its mission of uniting people in a good way. Therefore, the more conflicts there are in Europe, the worse our life will be here. Israel will be responsible for every clash or breakout anywhere in the world. The Jews always will be blamed for all of the troubles in the world. This is true because every conflict and clash, or every feeling of pain, is an indication that a sufficient portion of the Upper Light that can balance the pain and turn it to pleasure has not been received. It is the Jews who aren’t supplying this portion of Light. Question: How do you relate that to the fact that the media are constantly lying about Israel? Answer: They cannot do it any other way. From their perspective, if we are attacked, it means we are to blame. We must think about this in a spiritual manner, not a corporal manner. We are to blame according to the laws of nature because we have not provided the right portion of goodness and have not balanced the evil with goodness in advance. This is the reason that it was born, developed, and united against us. If we don’t wake up in time, the nations of the world eventually will declare war against us and want to destroy us. If the Jews don’t begin to listen to what Kabbalists say and continue to think that someone else is to blame, the same genocide we have witnessed in the past will be repeated, but this time on a much larger scale. Question: Does this mean that you believe we should shut down Israeli public relations since it will lead to nothing? Question: Should we also shut down the Israeli foreign office? Answer: We don’t need anything but a Ministry of Education implementing the method of uniting the nation. It must be the great educational project of Israel. This is what we must produce, and the world will buy it. This is the mission of the Jewish nation. We need only one office, a kind of a Sanhedrin, a spiritual leadership, and so we need Kabbalists who understand the real laws of nature. These laws teach people how to unite so that there will be peace in the world and among us, so that the connection between us and the Creator will be revealed in us, and flow from us to the entire world. We don’t need anything more than that. We don’t need to wait for the Western media to push us forcefully in this direction or wait for them to love us. It will happen only when we perform the correction. Opinion (from lenta.ru): “The term ‘middle class’ has been in use over the course of two and a half thousand years – the first time it was used was around 420 BC, when the ancient Greek playwright Euripides put into the mouth of Theseus, the hero of the comedy ‘Beseeching,’ the following words: ‘It is only the middle class support who the city; he submits to its laws and authorities.’ In the following century, the idea was developed the great philosopher Aristotle, who pointed out in his treatise ‘Politics,’ that ‘the state, which consists of average people, and will have the best system of government.’ In this sense, the term originated in 1913, when the Statistical Office of Great Britain marked the term middle class as segments of the population who are between the ruling class and the proletariat. … Since then, Western sociology sees the middle class as the main support, and political and economic stability of the state – in full accordance with the precepts of Aristotle. “But last year, American sociologists have sounded the alarm. Although the world-wide share of the poor is steadily decreasing (from 25 to 15 percent in the first 10 years of the century, according to the World Bank – the percentage of people in low- and middle-income countries during the same period increased by 6 percent and 8 percent, respectively), the USA marked a clear tendency to ‘shrinkage’ of the middle class. Some of its members are moving into the category of the rich, but much more are those who descend to the bottom bracket of income. … If in 1971, 80 million American adults, or nearly 61 per cent of the working population (131.6 million people) belonged to the middle class, in 2015 their number has increased even though in absolute terms to 120.8 million, but now of less than half of the total number of able-bodied citizens of the USA. Also the structure of the distribution of aggregate household income changed. In 1970, the middle class earned 62 per cent of money in the country, by 2014, this figure dropped to 43 percent. Wealthy Americans have increased their share from 20 percent to 49 percent. Apparently, a similar pattern is observed in other developed countries. Commentary: The richest people in the world who are merely 1% of the world population own more assets and property than 99% of the population. 62 people own the same amount of wealth as 3.6 billion people who are the poorest half of the population. Since 2010 the wealth of these rich people grew by 44% and that of the poor population decreased by 41%. My Comment: The ego is pressuring every individual to a point that he must fulfill his needs. It makes no difference how rich a person may be, he will feel increasingly more “unfilled” and will continue to aspire for more until all the wealth in the world belongs to him and then the whole universe too. So I hope that the upper class will come to their senses and stop and leave something to the lower classes. Inequality in the world is moving towards 1% wealthy people and 99% poor people with no middle class. This is the law of our egoistic nature. The Middle Ages Or A Bright Future? Orthodox Youth To Join The Army? Question: Several influential rabbis strongly condemned the campaign in support of the mobilization of the ultra-Orthodox youth in military and alternative service. In particular, the rabbis in Jerusalem said that the campaign should be considered sinful and deserves condemnation. They even signed an Halachic ruling. It is a long struggle that is now gaining momentum. More recently, police detained a group of ultra-Orthodox on suspicion of incitement against the supporters of the mobilization. What do you think about this? Answer: This is a big problem that has to be solved. I can not imagine any of the Orthodox Jews that are surrounded by the Arab population, not being protected by the Israeli army. On the one hand, they understand that perfectly. On the other hand, do not wish to participate. There is no doubt that the Arabs don’t differentiate between non-religious and religious Jews and don’t really care who is who. Today, they are the spearhead in the attacks to destroy Israel and the Jews. And the ultra-Orthodox Israelis must defend themselves from third-party influence. They protect themselves, the “ghettos” in which they live: Jerusalem, Bnei Brak, ultra-Orthodox areas in all the cities of Israel, because otherwise they can not exist. They are afraid of dissolution in the secular community, and therefore I understand it. Question: Don’t you see a solution? Answer: There is no solution. It is a serious schism that has been going on for a long time. There must be a division between the general religious population and the Orthodox sector because there are other religious sectors who serve in the army, and many of them even serve in combat units. This is basically a political game because from the non-religious perspective, the Israeli Defense Forces don’t need them. We simply must leave this issue and not deal with it. It is a political squabble before elections when each party takes pride in being for or against it, and thus tries to make a political gain. Generally speaking, this issue isn’t worth discussing since it will lead to nothing. I don’t side with any of the parties. I simply am stating a fact. Question: Austria is proposing to expel Greece from the Schengen area (the community southeast of Luxembourg located next to the triangular borders of Luxembourg, France and Germany). The Austrian Interior Minister demanded that Greece, already burdened with debt and problems, close its sea and land borders with Turkey and prevent the flow of refugees who are penetrating Greece from Turkey and going on to Europe. How realistic is the Austrian demand, and what can Greece, Turkey, and Europe do about this situation? Answer: Turkey is not interested in stopping the flow of refugees or limiting it in any way. On the contrary, it is interested in allowing the maximal flow of Muslims into Europe because it is a Muslim nation. Greece is not able to close its borders, not merely because it has a weak army, but because it is has hundreds of islands.If a boat with immigrants come to the shore to some of the island, would each island be equipped with a military force? Each of the islands has a pair of police officers, but they can not and will not. What will they do against the usual 30-40 healthy youths who get off a boat? Question: So the European Union wants to sever Greece from Europe so that the refugees will remain in Greece? Answer: Certainly, I understand that Europe very simply solves its problems at the expense of the weak. It has a very direct, practical, and strict approach. It immediately does what is beneficial to it, without delay. However, the issue is not about Greece. The EU well aware that if the migrants don’t pass through Greece, they will look for other nations to cross through. We see how these people are going by a circuitous route to Murmansk and continuing on from there. Arabs are coming from warm Middle Eastern countries by way of cold Russia. It is difficult for me to imagine how they won’t freeze on the way and die. It is not possible to stop this flow. It will not make any difference how many parliamentary meetings will be held. This will not bring any results because millions of people are already on the way, and they will clear their way by all means and methods. Along with millions of migrants, the fighters of Daesh also will pass through. In fact, Europe has brought itself to a situation in which it is already occupied. In comparison to its power and solidarity (more precisely, its lack of solidarity), the mass that has already filled Europe is sufficient to do what it wants there. The migrants will pass through the process of absorption and adaptation. They will settle and rapidly put down roots because they are not pretentious. Then, they will begin to bow Europe under them. Europe itself will let them do this. In the wisdom of Kabbalah and in the books of the prophets, it is said that Ishmael, which represents Islam, will conquer Europe and dominate it. Question: Not long ago, I returned from Bulgaria, and I was convinced that the social opinion is very clear there. The Bulgarians are not prepared to allow the migrants into their country, and indeed they are not found there. The same thing is happening in Poland, Hungary, and Slovakia; while in Norway, Sweden, and Germany, they are opening up their countries to the migrants, without taking any effective means against it. How is it possible to explain that the various peoples of Europe are not behaving in a similar and unequivocal manner? Answer: It is difficult for us to understand this because we have not gone through the entire process of social development of the Western European nations, especially that of Scandinavia, which has become so socialist that it can no longer change back. Question: For the Scandinavians, there is no longer anything to want. I asked the Norwegians what their children want, and they could not answer the question. In these nations, there is only foreign labor at work. The local residents don’t even understand what to do in life. Their future seems entirely arranged to them. Answer: This is happening at the present time until the foreign workers become the masters. That is usually how it happens in history. Europe was once conquered by the Romans. After that, the Romans became weaker and Europe conquered them. The present historical period is typified by the spread of Islam over Europe, exactly as Europe once wanted to extend itself over the Islamic nations. From a historical point of view, there is nothing new in this, but the period ahead is shocking to us because Europe is the center of culture and developed civilization that is going through a wild fall. There is no remedy that will help anymore, except for one: It is only if all of the civilizations and religions will understand that the future must be in resembling nature, and that nature, the Creator or whatever you want to call it, is demanding that we become integrally linked with each other. If we don’t achieve this, we will constantly receive all kinds of blows. We already see that we cannot control and manage the connections, resources, and systems that we ourselves have created in human society. We cannot continue to exist normally. A decline in morality and all human values is happening. We are not giving anything to our children and have ourselves reached a common understanding that there is no need to raise a family, to reproduce, and no need to educate children. We have reached a situation where the system is beginning to bury itself. The result is that we understand that resemblance and equivalence to nature, about which the wisdom of Kabbalah speaks, is the correct and singular solution to the problem. So, we must take an example from nature. This could happen after many blows and wars, and it could happen much sooner if people would begin to listen to the Kabbalists and we were to create the correct society. In any case, humanity must break this deadlock. We hope that humanity will achieve this with only a minimum of suffering. The Bible is the book of life. It tells us how to ascend above our ordinary attitude to life and how to flow in one current, like a river in which a person connects to the water and flows in it. We all know the stories of the Bible on one level or another, but few understand its uniqueness. The Bible isn’t a book that teaches us history or geography, and it isn’t a book of laws, either. The Bible is the book of life and it has the power to affect the reader so that by reading it he changes and discovers that it is about himself and that everything in the Bible is inside him. The Bible is written in a code that must be deciphered, and in order to deeply understand it, we must learn a new language, the language of bestowal. According to the wisdom of Kabbalah, bestowal means to bestow abundance. Bestowal is a special, internal attribute of giving that is not easy to acquire. A person who acquires it is in a reality of love of others and is called a Kabbalist. One may be confused and think that we also feel love of others now, but if we look at ourselves without embellishing things, we will discover that alongside the love we have of others, there is always a certain level of self-pleasure, a pleasant feeling, satisfaction, and so on. Our nature doesn’t allow us to love unilaterally without receiving anything in return. When a person ascends above his nature, a new channel of perception, thinking, and of feeling opens up for him, and he begins to live in an embrace with the Bible. It is only through the attribute of love, through the connection between us, that we can open the Bible correctly. We are called the people of the Book, and we have the responsibility to open the Bible and learn its internality. This is the reason that we must ascend to a state of total bestowal, love of others, love of the world, and then we will understand what it says. 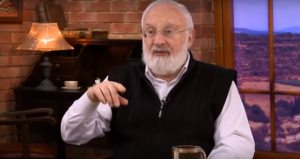 This revelation is possible only through connection and love that are attained by studying the wisdom of Kabbalah. Therefore, there is no need for any special intelligence or sublime attributes. The only thing you need is a desire.